Scorchers end the season at the last position with only four wins. 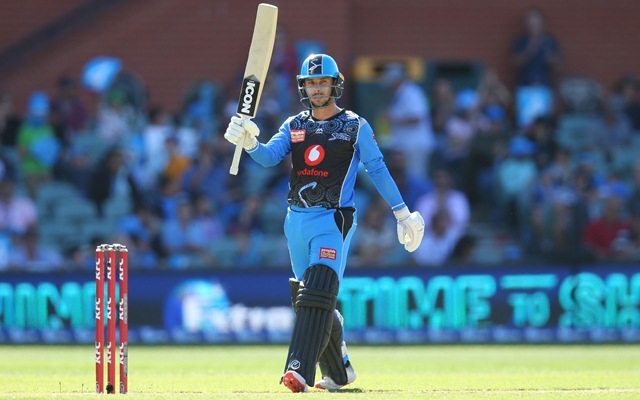 The defending champions Adelaide Strikers have ended their dismal campaign in this year’s Big Bash League (BBL) with a clinical win over the Perth Scorchers. They finished the season with six wins from 14 matches and one more win in their kitty could’ve presented them with a chance to qualify for the semi-finals. Nevertheless, the Strikers put up a commendable show against Perth Scorchers who end up eighth in the points table with only four wins. The Scorchers opted to bat first Josh Inglis and Nick Hobson opened the innings for them. The latter was dismissed early by Billy Stanlake after which a decent partnership followed. Cameron Bancroft and Inglis took the team past the 50-run mark. Ashton Turner bagged a golden duck but then Inglis joined hands with the skipper Mitch Marsh. Both of them added 55 runs together before Inglis was involved in a mix-up and run-out on 55. Marsh continued an impressive outing and slammed a 41-ball half-century. However, the real impetus to the innings was given by Nathan Coulter-Nile. He smashed 25 runs off just 8 balls to propel the Scorchers to a competitive total of 174 runs for the loss of six wickets. Rashid Khan was brilliant as usual as he returned with the figures of 2/22. Alex Carey scored a quick-fire 27 off 18 balls in the chase but the top three fell fairly quickly for the Strikers. At 64/3, they were in trouble of losing their last league game. But Jonathan Wells and Harry Neilsen batted well to bail the team out of trouble. They counter-attacked the Scorchers bowlers who weren’t expecting it at that stage. The duo added 88 runs for the fourth wicket in just 55 balls and put the team in a winning position. The best bowler of the day Coulter-Nile accounted for Wells’ wicket by castling him but it was too late by then. Neilsen remained unbeaten until the end and took the team over the line. While he remained not out on 44, Wells played a match-winning knock of 69 runs off 42 balls as the Strikers had the last laugh in the encounter.